Mummies Bingo Review | You Have a 100% Bonus + 20 FREE Spins! Calling all yummy mummies! Even mums deserve to have some fun once in a while so make some time for yourself and head over to Mummies Bingo where you can play bingo with other busy mums. Having kids isn’t cheap but don’t worry there’s plenty of free bingo for you to enjoy at this top site as well as some attractive bonuses. Fancy playing some free bingo? Then how does an entire week sound? That’s right you’ll get 7 days of no deposit bingo access just for registering and you never know you might even turn your no deposit bonus into an even bigger playing pot. As well as your no deposit bonus there’s also a 100% bonus + 20 free spins to take advantage of when you make a first deposit of £20 or more. If £20 sounds like too much you can instead deposit just £10 and to receive a 50% bonus, giving you £15 to play. 1 week of free bingo games access, no deposit required. Play for £6,000 in Sliding Jackpots every evening. Enjoy penny bingo games for £5 fixed pots. There are lots of freebies up for grabs at Mummies Bingo and the great thing is that you don’t need a promo code to claim any of them. Make sure you check them out on Facebook and Twitter, here you will find exclusive codes, competitions, bonuses and more. Mummies Bingo is great for busy mums because it’s mobile friendly so you don’t need to be sat at a computer to play the games you love. You can sign in via your tablet or mobile phone using the same login details as you would use on the main site and best of all you’ll still be entitled to the welcome bonus if it’s your first time at the site. The next thing we’ll cover in this review is the games lobby. What’s super exciting about Mummiesbingo.com is that it’s part of the Live Bingo Network so not only do you have a ridiculous amount of promotions to take advantage of but you also have access to some of the best games around. You really are spoiled for choice here with four types of bingo to choose from including 90 ball, 80 ball, 75 ball and 30 ball. Once you’ve decided what kind of bingo you want to play you’ll then need to think about how much you want to fork out on tickets. The tickets start from as little as 1p and the highest ticket price is just 25p so it won’t be much anyway. Most of the games are pre-buy so even if you don’t manage to peel yourself away from the kids your tickets will still payout. As well as bingo there are slots and casino games for you to check out. Some of the biggest slot games include the likes of Treasures of Egypt, Rolling in the Dough, Starburst and White Wizard to name just a few of them. If you like to try before you buy then you’re in luck because under the ‘Freebets’ tab you’ll find a number of slot games that won’t cost you a penny to play. The only downfall is that you can’t win any cash from these games but that won’t matter to you if you’re just starting out and looking to get a feel for the games before playing for real. 7 days of risk-free bingo on sign up. No exclusive games or promotions. Do not confuse this website with Bingomum.co.uk. Email address: Use live chat or email ticket system on the official website. 4x bingo, 40x slots wagering requirements. Most major credit and debit cards are accepted as well as Paysafecard and Neteller. Minimum deposit of £10 required. Minimum withdrawal amount is just £1. Your withdrawal request will be processed within three working days. 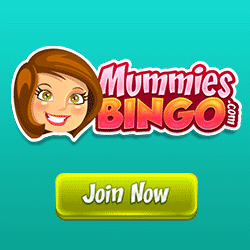 Mummies Bingo is the perfect site for new players and beginners. No deposit is required to get started, making it a completely risk-free proposition. Mummies is also part of the Live Bingo Network, using Cozy Games software, which gives it a great platform backing them up. You will find plenty of large jackpots to be won and the bonuses given away on deposits make sure you will have a lot of funds to spend on the site without splurging much cash.